As a leathercrafter, you may contemplate buying machinery to increase your speed and efficiency. Whether you are a hobbyist or a professional, there are machinery options in all price levels to meet your needs and boost your productivity. 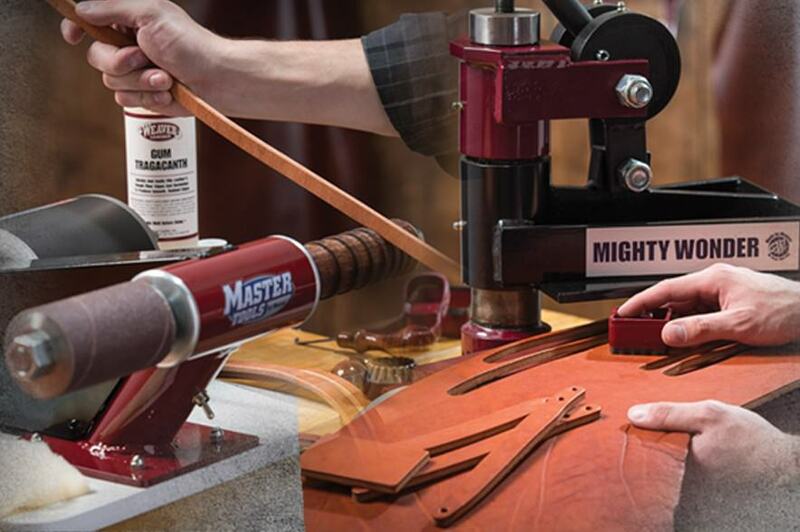 There are so many different machines and so many different suppliers out there that it can seem overwhelming for even the most seasoned leathercrafter to make a buying decision. Following are a few things to keep in mind whether you’re making your first purchase or have made several machinery purchases in the past. What repetitive tasks do I currently perform that could be streamlined with a machine? Do you set many snaps, spots or crystals? Do you punch lots of holes? Do you crease your leather edges by hand? Do you cut out many leather pieces of the same shape? If your answer is yes to any of these questions, there are machines that can make your job much easier. Check our Master Tools Little Wonder®, Master Tools Rotary Punch, Master Tools Power Edge Slicker, Master Tools Mighty Wonder 4 Ton Hand-Operated Clicker, Master Tools Self-Centering Punch as well as our entire line of Master Tools Machinery and think about whether the time savings you’d experience with these machines would make a machinery purchase a worthwhile use of your budget. What is my budget for machinery? Obviously, whether you are a hobbyist who makes a few items for family and friends or a professional who produces multiple items for resale will have an impact on your machinery budget. However, you may be surprised how reasonably priced a machine like our Master Tools Little Wonder® is when you take into account your time savings across all your projects. Carefully think about how much time you invest in performing a certain task by hand and weigh the benefit of saving time to determine if it makes financial sense to purchase a machine for your situation. What should I look for in a machinery supplier? When making any major purchase, it is important to choose a supplier who stands behind their product and has knowledgeable people to help you if you run into any problems. Look for a supplier who backs their machinery with a satisfaction guarantee, who provides excellent technical support and who has a reputation for providing knowledgeable customer service both before and after the sale. Purchasing machinery is an investment, and to protect that investment in the long run, it is important that you choose a supplier you can trust. Thinking through these questions will get you pointed in the right direction when making a machinery purchase. Like all major purchases, it is best to carefully consider your options and not make spur-of-the-moment decisions. A thoughtful machinery purchase can make the difference between a machine that will serve you well for a lifetime and a machine that only brings you headaches. The right supplier can make all the difference.